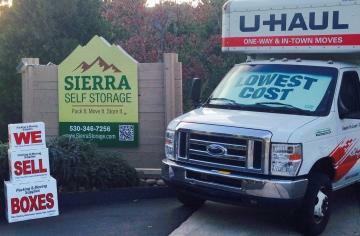 Sierra Self Storage is a professionally managed, locally owned state of the art facility offering storage units at discount prices, boat & RV storage, a wide selection of moving supplies, boxes and U-Haul truck and trailer rentals. Sierra serves the Colfax and greater Interstate 80 (I80) corridor from Foresthill and Auburn to Truckee including Chicago Park, Grass Valley, and Nevada City. Our NO LATE FEE Guarantee!